amazon prime pre ordered on wed, shipped today. Yep it`s on the way boys! Time to ride this hype train until we knock F11 off the face of the planet! Mine is on its way too. They moved the shipping date. Maybe Monday! I had a dream last night. I was at the Mothers HQ, discussing the blueprints of what would become CMX. Mothers: Do you like beading? My subscribers are going to murder me for doing the Adam`s video when I show them CMX. Flashback.....years and years ago, when I was in California, I was a year or so into my mobile detailing business (so 30 years now) and I stopped in at the Mother`s place. I believe I spoke with one of the son`s who had just got back from surfing in the morning. We talked for a good while and he gave me handfuls of Mother`s products because they were changing the bottles and labels. I had Mother`s products for days and days! That memory sticks with me, can`t remember his name but cool dude. "The Art & Science of Auto Detail"
CMX to the left, CanCoat on the right. Will put another coat of each on tomorrow and let this thing go forth into the NE Ohio winter. Maintenance going forward for the foreseeable future will be, well...none. Maybe a touchless tunnel wash just for giggles. Not gonna throw acid, APC or oil or anything else at it...just gonna leave it to it`s own devices out there in the wild. Edit: Hood was prepped and polished as would be normal for any coating application. So it`s definitely a heavy product, not the slickest, feels better than BSD. Insane beading is immediate, I don`t see how allowing it to sit any longer will improve the beading any further but I`m going to polish everything out and reapply and then I`ll wait until Saturday for the actual rinse test. 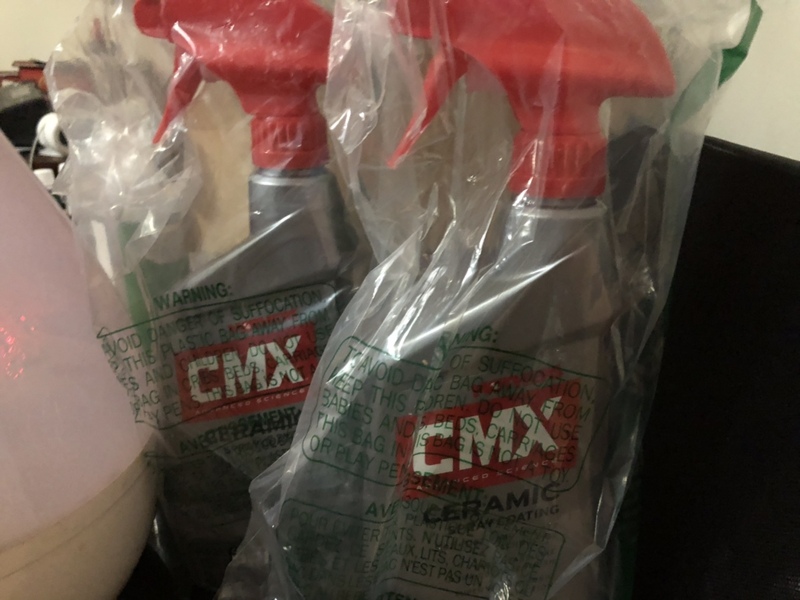 Overall, it seems a little like Cosmic Spritz coming out of the sprayer, that similar type of product consistency, but Polish Angel wipes in better and faster, CMX takes a little wiping to get it nice and clean. It seem to get the best out of any product the surface should be polished and prepped. Not gonna throw acid, APC or oil or anything else at it...just gonna leave it to it`s own devices out there in the wild. BudgetPlan1, are you at a point where you can describe this new CMX product? Do you like it? Is it slick to the touch? How do you feel about the "look"? Thanks. At first glance (and this might seem silly) the bottle itself with contents seems heavier than other similar products. It has a more substantial feel to it when spreading around as well. The CMX is slightly slicker to the touch than CanCoat. As far as gloss, *maybe* CanCoat has an edge if your diggin` the candy type of gloss whereas CMX is more of a `shiny gloss`. That whole topic of `glossier` is really just too subjective to make any real judgement on that would hold to be universal. People said Beadmaker was crazy, stupid gloss but while I found it to be glossy, it really didn`t stand out that much to me next to the PA Rapidwaxx I used next to it. There are 2 Mothers ceramic sprays on Amazon. There is the CMX ceramic spray and a hybrid ceramic wax spray. What`s the difference? Mothers only has one ceramic and Meguiar`s has hybrid ceramic wax. Two different products. There is a thread on here with regards to Meguiar`s Hybrid Ceramic Wax.